Draw or use rope to mark out a large circle. This is a Larger variation of ‘Piggy in the middle’ (game where one player attempts to intercept the ball thrown between two other players, swaps when successful with player who missed the catch). Divide into two teams with half in the circle and the other half outside. 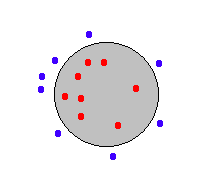 Ball is thrown between players on the outside across the circle (may not go around it). Throws can be made high or low, with thrower changing places with whoever intercepted their throw.